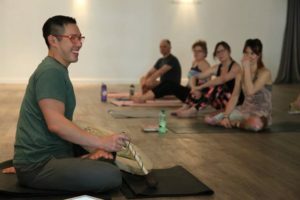 Did you know that Yoga Kula is running a 30-hour, five-day Experiential Anatomy + Bodywork Immersion with the incredible Jambo Truong from Monday 10th September – Friday 14th September? This five-day immersion highlights the key structural muscles that every yoga teacher, trainee, and student needs to know about. These structural muscles have many incredible functions and when they are dysfunctional, they can cause pain, limit mobility and strength development. By studying their unique personalities, practitioners will be able to confidently know where to start when working with limited mobility caused by injuries and pain. Each day will set a meditative intent followed by a yoga practice that is designed to enable practitioners to feel their own anatomy. By receiving specific cues, practitioners familiarise themselves with functional movement patterns that open up poses in a way that is designed to inform your system of practice, no matter what style of yoga or bodywork you practice. I first discovered yoga at about 14, but didn’t get into asana practice until I was 17. By the time I was 21 I had a daily practice of asana and meditation. The first one was a really crappy online course a good 12 years ago. Then I attended as many workshops as possible until I connected with teachers that I could relate to. In 2009 I did an Ashtanga, Ayurveda & Tantra training and I have taken 3 teacher trainings with Ana Forrest since 2010. Which style of yoga do you specialise in? What can students expect from your immersion? Students can expect so much from this immersion, it’s going to be incredible. Each day will be an immersive experience of ceremony that includes meditation, chanting, and movement. These ceremonies are inspired from various traditions including Native American and Taoist. We then get into a Forrest Yoga Inspired class so that you can have the experience of moving your own structures in a way that will enable you to feel what we are doing to go deeper into during the afternoons. Each afternoon will go deeper from the morning practice by applying what we did to each other. This informs your learning about anatomy, hands-on assists and bodywork. Will it be 50% theory and 50% practical? It’s more 20% theory 80% practical. There will be some sessions that are specifically for Q&As, therefore particular questions and needs can be addressed accordingly. Will there be partner work? Yes, a lot. Especially in the afternoon. When you learn to work on someone else’s body, you build a wider picture of how people respond differently to the same conditions and structural changes. This course is aimed at yoga practitioners who want to develop a deeper understanding of the science of movement within the magic of yoga. You do not have to be a yoga teacher to do this immersion, however, it is ideal for all current yoga teachers too. Learning how to touch and be touched will inform your own personal practice. You spent 16 years specialising in addiction, trauma and chronic pain. Is this immersion open to those people with addiction, trauma and pain? Yes! Absolutely! It would be a deep pleasure to work with anyone who feels that this style of yoga can support their recovery. If you are interested in joining Jambo and the Kula team on this five-day immersion you can book your place at the link below. If you would rather spread out the costs, we can set up a Direct Debit. There will be a small admin fee for setting up these payment options. Please email info@yogakulaleeds.co.uk or call the studio on 07445 625 645 to set up one of these options. We recently announced we are taking applications for the Yoga Kula TTC 2019. Do you want to train to be a yoga teacher? Full details can be found here.